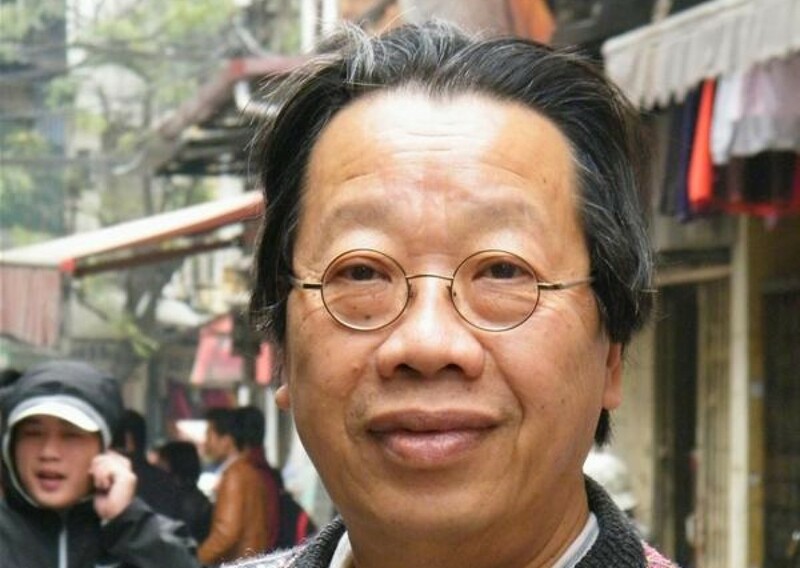 WIKIPEDIA : CA TRÙ : history, music, ca trù inns, ca trù in modern Vietnamese media, notable performers | DO YOU KNOW TRẦN QUANG HẢI – VIỆT NAM ? Ca trù (歌籌) “Tally Card Songs” also known as hát ả đào or hát nói, is an ancient genre of chamber music featuring female vocalists, with origins in northern Vietnam. For much of its history, it was associated with a geisha-like form of entertainment, which combined entertaining wealthy people as well as performing religious songs for the royal court. Ca trù is inscribed on the list of Intangible Cultural Heritage in need of Urgent Safeguarding in 2009. There are different myths and theories related to ca trù’s conception. One story states that a woman named Ả Đào created the genre, having charmed the enemy with her voice (thus explaining one of the genre’s alternate names: Hát ả Đào). Another theory points to a woman named Đào Thị, a talented musician who was beloved by the Lý Dynasty imperial court. This theory also claims that ever since the time of Đào Thị, in admiration of her, women who held a profession as singers (such as ca trù singers) were referred to as Đào nương (“nương” here refers roughly to “maiden” or “lady”). The latter is true although this term is no longer widely used in modern Vietnam. What is known for sure is that ca trù started off like many of Vietnam’s arts as being a form of entertainment for the royal court. Officially ca tru count the age of their profession since The Later Ly dynasty (Vietnamese: Nhà Hậu Lý, 1010—1225), at that time musicians called Vietnamese: hát khuôn performed only on religious court ceremonies. It was only later on that it branched out into being performed at small inns. Indeed, it was mainly scholars and other members of the elite who enjoyed the genre, which was somewhat inaccessible to the masses (who enjoyed the Hát chèo opera genre much more). In the 20th century, ca trù nearly died out. When the Communists came to power after the 1945 August Revolution, Ca Trù was systematically suppressed, becoming associated with prostitution and the degradation of women. Consequently, before 1976 there existed only two ca tru: Vietnamese: Nguyễn Xuân Khoát and Vietnamese: Quách Thị Hồ. Later they both started to revive the tradition of ca tru. In actuality, men were allowed many wives in the past and having extramarital affairs was nothing shocking. Thus, it was commonly known that many famous ca trù singers did indeed have affairs with important men, but it was just something to be accepted as a part of society back then, and not a part of the profession itself. By 2011 there were 140 ca tru from 23 clubs. Ca trù, like many ancient and highly developed arts, has many forms. However, the most widely known and widely performed type of ca trù involves only three performers: the female vocalist, lute player and a spectator (who also takes part in the performance). Sometimes dance is also performed at the same time. The female singer provides the vocals whilst playing her phách (small wooden sticks beaten on a small bamboo bar to serve as percussion). She is accompanied by a man who plays the đàn đáy, a long-necked, 3-string lute used almost exclusively for the ca trù genre. Last is the spectator (often a scholar or connoisseur of the art) who strikes a trống chầu (praise drum) in praise (or disapproval) of the singer’s performance, usually with every passage of the song. The way in which he strikes the drum shows whether he likes or dislikes the performance, but he always does it according to the beat provided by the vocalists’ phách percussion. The number of ca tru melodies is 56, they are called Vietnamese: thể cách. New observers to the art often comment on how strikingly odd the vocal technique sounds, but it is the vocals themselves that are essential in defining ca trù. Ca trù literally translates as “tally card songs.” This refers to the bamboo cards men bought when they visited ca trù inns, where this music was most often performed in the past. Men would give the bamboo cards they purchased to the woman of choice after her performance, and she would collect money based upon how many cards she was given. Scholar-bureaucrats and other members of the elite most enjoyed this genre. They often visited these inns to be entertained by the talented young women, who did not only sing, but with their knowledge of poetry and the arts could strike up a witty conversation along with serving food and drink. Besides these inns, ca trù was also commonly performed in communal houses or private homes. Along with efforts made to preserve the genre, ca trù has been appearing in much of recent Vietnamese pop culture, including movies such as the award-winning film Mê thảo: thời vắng bóng, or its mention during popular entertainment shows such as Paris by Night. It has even been used in Vietnamese pop music, where many artists have attempted to successfully synthesize ca trù (or aspects of it) with pop or other modern genres. Bich Cau Dao Quan Club, founded in 1992, now has 90 members, 30 or 40 of whom gather on a given Saturday evenings. The oldest artist is 88 years old. According to the director, 50-year-old Bach Van, who trains younger singers and introduces them to classical songs: “It is very difficult to find young singers who wish to learn this art form. It is also difficult to find good teachers who can convey both the enthusiasm and the technical knowledge.” Bach herself studied ca trù for ten years before the Hanoi Office of Culture appointed her the club’s director. Ca tru hat khuon Pho Thi Kim Duc : NSUT Pho Thi Kim Duc (voice, b.1931), NSND Nguyen Xuan Hoach (“dan day”), Dam Quang Minh (drum). This team is the best performers in Vietnam and over the world. NSUT Pho Thi Kim Duc did introduced “ca tru” to world friends in nearly 30 countries all over the world. Her voice is considered to be the best voice nowaday. Ca tru Thai Ha: Nguyễn Văn Mùi (the director , based in Hanoi; drum) and his daughters Nguyễn Thúy Hòa (voice; b. 1974), Nguyễn Thị Hà Vy (voice), and his sons Nguyễn Mạnh Tiến (đàn đáy; b. 1970) and Nguyễn Manh Khuê (đàn đáy; b. 1962). Nguyễn Văn Mùi’s granddaughters, Nguyễn Kieu Anh and Nguyễn Thu Thao (both b. 1994) are also ca trù vocalists. Nguyễn Thúy Hòa was taught by Ms. Quach Thi Ho, a renowned performer who began recording in 1955. Norton, Barley. “Singing the Past: Vietnamese Ca Tru, Memory, and Mode.” Asian Music, vol. 36, no. 2 (Summer/Fall 2005). Mê Thảo, Thời Vang Bóng. Directed by Việt Linh. Norton, Barley. Ca Trù: A Vietnamese Chamber Music Genre. International Association for Research in Vietnamese Music. “The Exotic Sounds of Ca Tru“, ThingsAsian.com. “National fest honours art of ca tru singing“, VietnamNews.VNAgency.com.vn. “Ca tru — Vietnamese cultural heritage”. Ca tru Thang Long Club. 2008. Archived from the original on August 20, 2011. The beauty of Ca tru, YouTube.com. 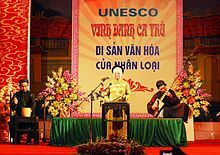 Previous PostWIKIPEDIA : LE CHANT CA TRÙ ,patrimoine culturel immatériel de l’humanité, VIETNAMNext PostXUÂN PHƯƠNG – NGÁT NGỌC : Văn hóa sao Việt – Kỳ 2: Nghệ sĩ hay ‘hàng tôm’, ‘hàng cá’?